The choking haze of pollution in the city leaves no room for poisonous fumes from crackers—Chinese or Indian. Do not reduce festival of light to scary annual statistics of ill health. Air is already heavy with toxic muck before Diwali. There is no room for more pollution either in our air or in our lungs. Like the festival itself, the buzz around its pollution aftermath has also become an annual ritual. Are we serious enough to not to make this festival an occasion to choke, wheeze, and suffocate our near and dear ones? Crackers not only spike pollution levels but also lace it with deadly cancer-causing substances. Is Delhi or any other city prepared to say ‘no to crackers’ this year? Pollution numbers and angry sound bytes in media show that people are worried about the foul air. But the policy action seems to be obsessed with only keeping Chinese crackers out of the market and not reign in the desi. This only detracts from the toxic and damaging impacts of all crackers, Indian or Chinese, on lungs, heart, brains and more. Forecast this time is ominous. The Indian Meteorological Department has said that the wind will drop from October 29. Forecast by Indian Institute of Tropical Meteorology shows that the particulate levels will hit the severe category—the worst category according to official air quality index. CSE’s analysis of air quality data from Delhi Pollution Control Committee shows that the level of tiny particles of less than 2.5 micron size (PM2.5) in October have already increased two times since September this year. In September, 23 per cent of days were in poor category and 13 per cent in very poor, and no day has experienced severe pollution. But in October, the share of poor air quality days have increased to 27 per cent, that of very poor to 57.7 per cent. Already 3.8 per cent days have experienced severe pollution. Right now, the levels are “very poor” which according to an official advisory can “cause respiratory illness on prolonged exposure and the effect may be more pronounced in people with heart and lung diseases”. But at the severe level even the general population will be impacted. The double whammy is when much before Diwali the Diwali traffic starts contributing harm and nitrogen oxide levels skew. Even sulphur dioxide, a very harmful gas and not a problem in Delhi otherwise, is several times higher than normal levels. Residential areas become gas chambers. To some extent, the growing campaign and awareness have started to shave off the horrible Diwali peaks. During 2010-2013, the level on Diwali day could go 11 times higher than the standards. The 2014 and 2015 peaks were comparatively lower. But the levels are still unacceptable and very harmful. How will regulatory action and awareness play out in Delhi this year to make a difference? The usual excuse for not saying no to crackers is that it is a matter of only one day and how can we deny our children the fun. But let us remember that after high intensity cracker bursting the toxic smoke disappears within few hours but pollutants settle invisibly all around us—in soil, vegetation, crop and water. What we put out comes back to us through our food chain. Our air quality regulators never monitor these impacts like other governments do. Globally, there are several iconic fireworks festivals that have generated clinching evidences. These are Yanshui festival in Taiwan, Montreal International Fireworks, Lantern festival of New Year in Beijing and Shanghai, Guy Fawks night in United Kingdom and several such events in European cities among others. In Spain they have found particles from crackers remain suspended in the air for over 20 hours causing very high exposure. Italy has found increased hospital admissions due to heart disease. Studies have found very high lung deposition during Chinese New Year. More studies have been carried out to show effects on water bodies and groundwater. A study published in Journal Environmental Science and Technology shows strong residues of perchlorate contamination in Okhlahoma Lake. They found 1028 times above background levels within 14 hours of the July 4 celebration each year. Exposure to this affects central nervous systems in children. There is bio-accumulation through food crop, plants and animal. If we are enjoying sparklers and glitters with our children then let us decode the chemical foot print of these crackers. Children are most exposed to cracker pollution. Children have poor defense mechanism. Their ability to metabolise and detoxify environmental agents is different. Given their hyper level of physical activities they inhale more volume of air than adults and therefore breathe more pollution. Equally vulnerable are the elderly, infants and the ailing. Crackers need carbon and sulphur to burn that produce a range of gases. To this, is added a large number of chemicals to act as stabiliser, oxidiser and binder. These are deadly chemicals– arsenic, manganese, sodium oxalates, aluminum, iron dust, potassium perchlorate, strontium, barium nitrate, and so on. Think of all the attractive colours and sparkles that mesmerise you. These colours have a chemical name—strontium for red, barium for green, copper for blue, iron for gold, copper and strontium for purple. What do they do to us? For glitter they use antimony sulphide that cause lung cancer and skin conditions. Barium nitrate used for green colour is poisonous, causing respiratory and gastrointestinal problems and muscular weakness. Copper compounds for blue trigger cancer, skin conditions and hormonal imbalances. Perchlorate is responsible for lung cancer and thyroid complications. Lead and chloride are detrimental to physical and mental growth in infants and unborn child. Most of the toxins accumulate in the body over time that in the longer run trigger cancer. Hospitals in Delhi report at least 30-40 per cent increase in wheezing, respiratory disease, bronchial asthma, bronchitis, and worsening of asthma. India Chest Society (October-December 2014) has issued warning about hearing loss, blood pressure, sleeping disturbances, heart ailments and nausea effects on pets. So think about the impact of one night of fun in a city where lungs of every third child is impaired. Global experience shows that fun has to be allowed within regulatory limit. Even in India Supreme Court gave guidelines way back in 2005. It asked the central government to reclassify all fire crackers into sound and light emitting and make guidelines for both. Sound emitting crackers should be banned from 10PM to 6AM. There should also be labeling guidelines for each category of firecrackers. The court took note that the current guidelines on manufacturing crackers do not take into account the air pollution aspect. There should be composition based guidelines to reduce air pollution. Government should also step up awareness campaign and promote community based fire crackers usage. But these have not been implemented. Only noise regulations for crackers are in place and chemical composition has been defined for this. But there is no clear mechanism for proper enforcement and checks. Enforcement agencies shy away from implementation fearing serious public backlash. Hurting the sentiment has become the excuse for not taking action. But health damage of our near and dear is far more compelling and powerful sentiment. 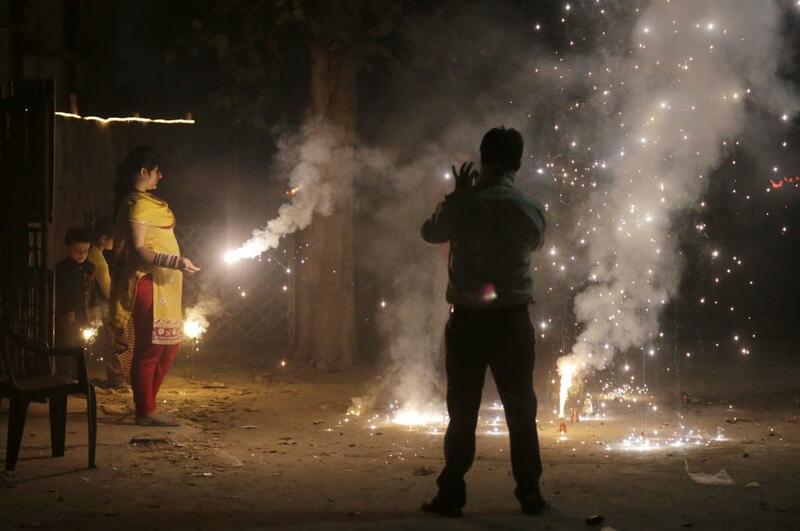 Several governments around the world have tightened regulatory noose around crackers. Instead of focusing only on cracking down on Chinese crackers take a leaf from the tighter regulations for crackers in China. More than 138 cities in China have banned fireworks while another 536 cities have imposed restrictions on their sale and usage. Beijing has further strengthened local regulations that has increased low sulphur fireworks significantly in 2015. Firework is restricted to a limited area during Spring Festival. Fireworks are not allowed during smoggy days. The city government recently introduced a regulation requiring people who buy five or more boxes of fireworks to register with an official ID. The city halts fireworks sales entirely if the pollution rise to dangerous levels. There are time and place restrictions. All fireworks are labelled. Shanghai has cut the city's number of firework sellers after pollution levels increased five times after fireworks extravaganza in 2013. Hangzhou has cancelled its annual New Year fireworks display, a decade-long tradition. China is now innovating new techniques for green fireworks. These are made of special paper and without sulphur. They emit less smoke and leave almost no scrap. All fireworks are labelled. Similarly, the Fireworks Regulation Act 2004 in United Kingdom prohibits the use of fireworks in England and Wales between the hours of 11 pm and 7 am, although extensions are given for the following special events. These regulations are enforced by the police. There is on-the-spot fine of £90 and a penalty of up to £5,000 or six months in prison for selling or using fireworks illegally. There is strict time restriction for cracker burning and sales. In several regions there is a growing trend towards community based organized events that are restricted in numbers. This reduces household based uncontrolled use of fire crackers. The United States have stringent rules for fireworks prohibiting chemicals including arsenic sulphide, boron, chlorates and others. There are stringent licensing regulations for sale, purchase, and timing. Several cities are controlling cracker bursting. Can we do this Diwali differently? The growing public concern and outcry over foul air in Delhi and the bitter anger over the “most polluted city tag” will sound hollow if we don’t get serious about convincing our family, neighbours, and the community to stop this deadly game. We also have to support government to enforce rules. Enough of ostrich syndrome, we cannot look away anymore. The government has to act and take hard decisions. Several steps are possible that can be rolled out to phase out the problem. Limit licenses and areas of sales to control sales volume: There have been discussions from time to time on the need for some scrutiny and advisory on the number of licenses to be issued for sale of crackers in Delhi. This has not worked. The way it is designed now has loopholes and leakages. For instance, small volumes of sales like 100 kgs do not need license and this is widely misused. It is important to regulate and limit sale of crackers. Through a time-bound licensing policy a phase out strategy is possible. That will also give the industry to adjust and restructure. At the same time enforce and organise random inspection to check non-compliant crackers. Enforce time restriction already in place and discourage fireworks in sensitive areas: Way back in 2005 the Supreme Court had intervened to direct that sound emitting crackers to be completely banned between 10PM and 6AM. Guidelines have also been drawn up related to the location and distances for bursting of crackers. Crackers should not be burst near sensitive areas like near hospitals and schools. Regulate composition of crackers to eliminate hazardous chemicals and metals: The Supreme Court has already directed that competent authority under the Department of Explosives to notify regulations regarding the recommended and permitted composition of each type of firecrackers. As of today there are no clear regulations to control air emissions from crackers. This will require rigorous review and assessment of the chemicals and metals currently going into crackers and regulate their use and size. For instance, eliminate heavy metals. Low sulphur crackers and other replacements can be identified. Enforce proper labeling programme with statutory warning: Labeling and packaging of all fireworks in India must be mandatory and must include the chemical composition, categorisation and the expected effects on environment. Violation should lead to cancellation of license. Display of chemical composition and sound level as well as statutory warning on crackers can help to influence public to make informed choice. This needs stringent enforcement. Impose pollution cess on crackers: Both manufacturers as well as the users should be made liable for the health and environmental damage from fireworks. This will be an effective demand management tool. Need winter firework policy to link cracker burning with air pollution levels: Crackers are burst not only during Diwali but also in thousands of social events all through the winter. There is a need for a policy to not allow fire crackers during the four winter months. To make public more aware, it is important to issue frequent public health alerts through media and other public communication systems about the changing status of air quality especially when the level hit very poor to severe levels defined by the Air Quality Index. It is important to give out public health advisory to help the vulnerable especially those who are suffering from heart, respiratory ailments and asthma. The advisory can seek restraint when pollution levels are in the very poor and severe category. Further tighten sound standards for crackers: Pollution hotspots demand action that is more stringent than the common minimum national norms. Kolkata has taken the lead to impose lower sound limit than the national norm. It is time to monitor a wide range of environmental impacts: It is a global practice to monitor the impact of fireworks on air, water, soil and vegetation to assess the deposition of chemicals and heavy metals on plants, water bodies. The same chemicals can come back to our food chain. This is needed to understand the total risk and also sensitise the community about the total health and environmental risk. This will also inform mitigation action. Intensify public campaign to sensitise community: Leverage the network of schools, colleges, RWAs to maximise outreach. Involve the medical community and hospitals in Delhi to bring out health information in public domain to sensitise the community. The campaign needs to promote the idea of community celebration and discourage household level cracker bursting. We are all looking forward to Diwali that is just two days away. We cannot reduce this wonderful festival of light that breaks all barriers and binds communities, to scary annual statistics of foul air and ill-health. Are we ready for Diwali? The fire-crackers has become show of money power. Flaunting unregulated and flamboyant expenditure on Diwali for burning out fire crackers is the result of intense consumerism that festivals offer in the country. Time has come to review the economic spin-off from these merchandise that on the one hand enhance employment in both manufacture and trade of the highly risky and accident-prone commodity, but also cause immense nuisance and health hazards to all biological organisms including humans. As ably steered in this BLOG by Dr Anumita R, can a CSO voice be pushed upto government regulatory system for explosives to put mandatory labelling with pictorial depiction of health hazards due to fire crackers, analogous to tobacco products? A thorough review and an accurate forecast of the present state (3rd November) of air quality being observed over Delhi. However, apart from making strict laws and controlling composition and number of licences etc. it is of paramount importance to ensure the proper implementation of same. As observed in the case of paddy residue burning in Punjab and Haryana where the government agencies have no doubt tried their level best in making proper laws on banning the same but its proper implementation still remains a distant dream. you are right. But we can't reduce the celebration of this wonderful festival. We must take steps to protect our environment.